You may remember D'Souza from a recent controversy. OCTAVIO JONES | Times Republican Party of Florida Chairman Blaise Ingoglia gives the opening speech at the Sunshine Summit held at the Rosen Shingle Creek Hotel in Orlando, Florida on Friday, November 13, 2015. Republican Presidential candidates give their campaign speeches at the Republican Party of Florida's Sunshine Summit. First the Republican candidates for governor will debate. Then a man who mocked Parkland school shooting survivors will address the crowd. The Republican Party of Florida Monday announced Dinesh D'Souza, Kayleigh McEnany and Dan Bongino will be three of the speakers at the 2018 Sunshine Summit in June. McEnany, a Tampa native, Harvard-educated lawyer and one-time Adam Putnam congressional intern, is the television and radio spokeswoman for the Republican National Committee. Bongino is a former Secret Service agent who has written several books about his experience in government. "Dinesh D'Souza, Dan Bongino and Kayleigh McEnany have become household names, and we are incredibly lucky to have them kick off our powerful lineup of speakers for the Sunshine Summit," Republican Party of Florida Chairman Blaise Ingoglia said in a press release. "We look forward to hearing their message of liberty, opportunity and limited government." Those three won't be the only speakers, Ingoglia said. "Attendees should expect an exciting program filled with dozens of dynamic nationally-recognized speakers, experienced statewide Republican candidates and enthusiastic party leaders," Ingoglia said in the press release. "We anticipate rolling out the list of remarkable conservatives joining us in the coming weeks." RPOF announced last week that the event will begin with a Republican gubernatorial debate. (Update 5:10): Chris King and Andrew Gillum, two Democratic candidates for governor, took to Twitter to slam RPOF's decision to invite D'Souza. TALLAHASSEE, FL- Today, the Republican Party of Florida (RPOF) announced Dinesh D'Souza, Dan Bongino and Kayleigh McEnany as the first three speakers confirmed for the 2018 Sunshine Summit, June 28 and June 29 in Orlando, FL. "We are excited to once again be hosting our state party's now iconic and most anticipated grassroots event this summer," said RPOF Chairman Blaise Ingoglia. "Attendees should expect an exciting program filled with dozens of dynamic nationally-recognized speakers, experienced statewide Republican candidates and enthusiastic party leaders. We anticipate rolling out the list of remarkable conservatives joining us in the coming weeks." Ingoglia added: "The RPOF is happy to have already confirmed three of the leading and highly influential conservative voices. Dinesh D'Souza, Dan Bongino and Kayleigh McEnany have become household names, and we are incredibly lucky to have them kick off our powerful lineup of speakers for the Sunshine Summit. We look forward to hearing their message of liberty, opportunity and limited government." "I am truly honored and excited for the opportunity to address Republican Party leaders, grassroots activists and strong conservatives, alike, at this years' Sunshine Summit," said prominent bestselling author, scholar and filmmaker D'Souza. "As a key battleground state, Florida plays a pivotal role in preserving our nation's past, while securing the future of our republic. I look forward to delivering a message of hope and action that will inspire conservatism throughout the Sunshine State." Former Secret Service Agent and New York Times bestselling author Dan Bongino said: "I've lived in quite a few places but there's no place like Florida. We aren't a swing state, we are THE swing state. 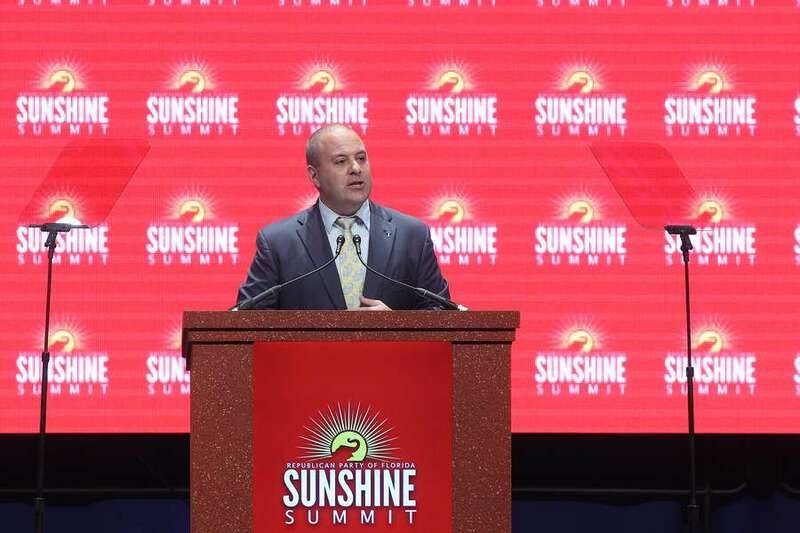 I'm excited to play a part in the Sunshine Summit, and to meet and speak to Florida's conservatives, the frontline warriors in the never-ending fight for liberty." "I am humbled and grateful for the invitation to speak to the grassroots at the Sunshine Summit. I'm looking forward to sharing a message of empowerment that will help propel the Republican Party to victory in the upcoming midterm elections," added RNC Spokeswoman Kayleigh McEnany. Taking place at the Gaylord Palms Resort & Convention Center, the RPOF Sunshine Summit is a unique two-day event, where Republican statewide candidates will share their vision for Florida and this nation, with more than 1,500 voters, grassroots leaders and party activists. Kicking off June 28 with a nationally televised FOX News Channel Florida Gubernatorial Primary Debate, moderated by Special Report anchor Bret Baier and The Story anchor Martha MacCallum, the Sunshine Summit promises to showcase the best of the best in Florida Republican politics.